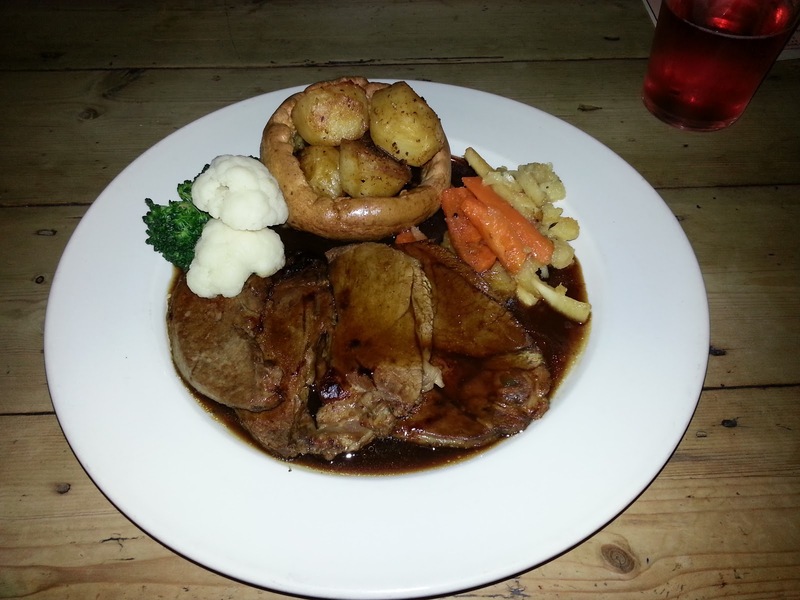 I thought I should bring back the search for the perfect roast dinner in and around the Reading area. I went to the Lyndhurst, on the edge of the town centre, a nice, friendly locals pub which is well-run and has a very good choice of drinks. 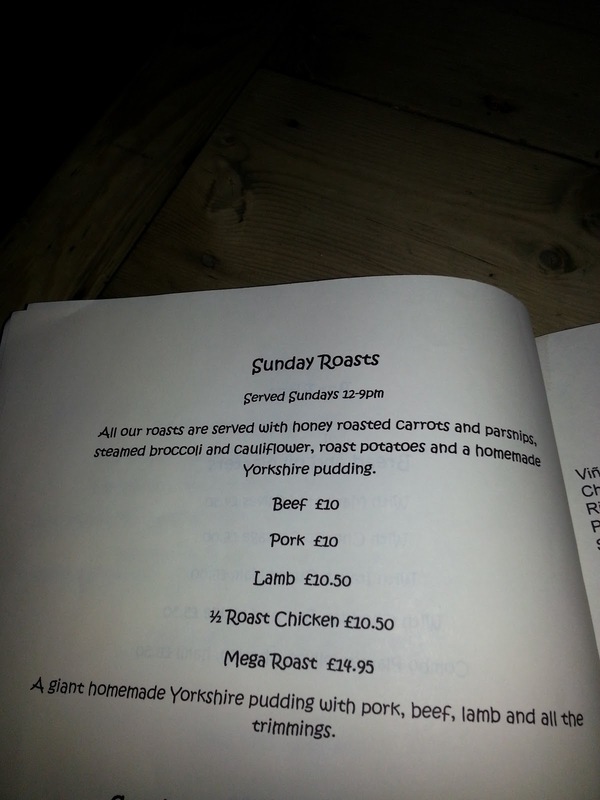 As you can see, they had a good choice of beef, pork, lamb and roast chicken – along with a mega roast! Had I not had breakfast, I would have attempted the mega roast. I went for the roast lamb, which at £10.50 is a decent price. As you can see below – it was well-presented and tidy. I shall start with the least important – the vegetables. Thankfully no peas. There was 4 different vegetables, one I didn’t recognise, some kind of yellow stuff. The vegetables were a little too cruncy for my personal tastes, but generally good still and not a criticism. The potatoes however were rather rubbery in texture and though edible were not good. This however was the low point of the roast dinner and it gets much better from here. One yorkshire pudding, and it was a decent size and a tasty yorkie. There was three slices of lamb, a perfect thickness and nicely tasty. A good cut of lamb. And last but certainly not least – the gravy. 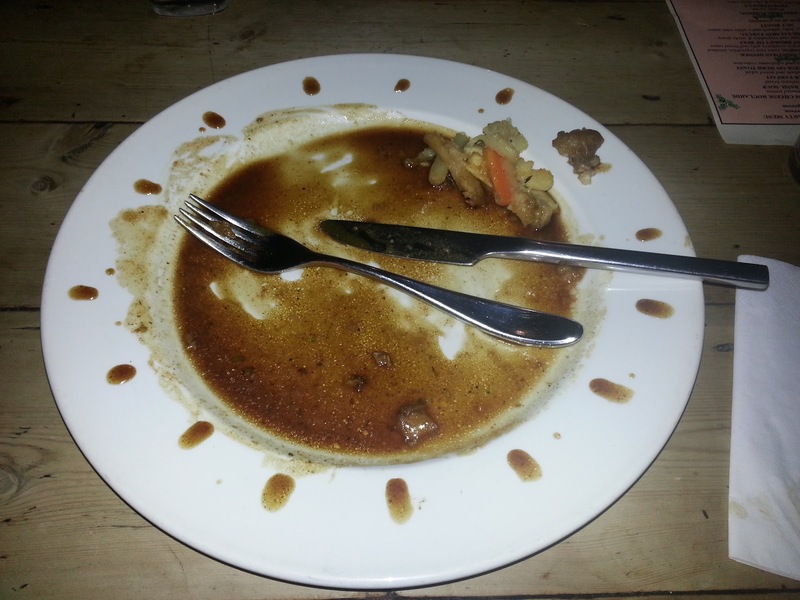 It was very tasty gravy, and the consistency was nicely thick – but not too thick (I do like my gravy super-thick but most people don’t down south so this is probably about as thick as could be acceptable). None of this water gravy crap that many places serve up. Proper gravy – and no skimping on the amount. As you can see below, it was the perfect thickness to do a little gravy art. Good job I went with friends and not my mother. A friend of mine also had the pork roast which looked even better than the lamb (and another friend had the sausage and mash which also looked superb but doesn’t count as a roast dinner). I am going to give it a rating of 7.5 out of 10. A good roast dinner at a good price, and I will be back to try the pork or maybe even the mega roast one day.